Citation Information: J Clin Invest. 2004;113(8):1114-1117. https://doi.org/10.1172/JCI21632. Understanding of autoimmune sensorineural hearing loss (ASNHL) has been hindered by the inaccessibility of the inner ear to biopsy and the lack of workable animal models. A report in this issue of the JCI describes a mouse model of CD4+ T cell–mediated ASNHL induced by immunization with peptides from the inner ear–specific proteins cochlin and β-tectorin. 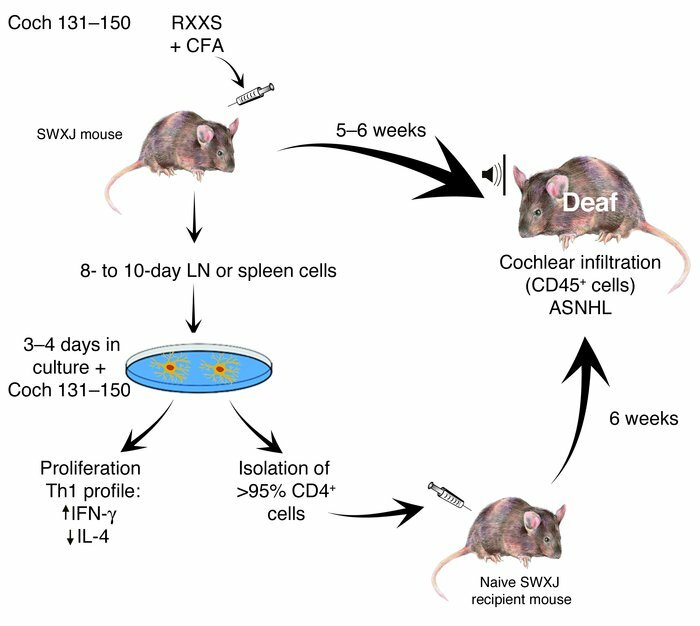 Systemic immunization of autoimmune-prone SWXJ mice with Coch 131–150, an RXXS peptide from the abundant IE extracellular protein cochlin, induced CD45+ cell cochlear infiltration and ASNHL in mice within 5–6 weeks. Lymph node (LN) or spleen cells placed in culture 8–10 days after immunization proliferated, as evidenced by 3H-thymidine incorporation, and showed a Th1 cytokine profile (high levels of IFN-γ and low levels of IL-4 production) after restimulation in vitro with Coch 131–150. Flow cytometry confirmed preferential reactivation of CD4+ T cells. After restimulation in vitro with peptide, the total population or the CD4+-enriched population (>95%) of cells induced ASNHL 6 weeks after passive transfer to naive, irradiated, histocompatible recipient mice. The same results were obtained after priming, restimulation, and transfer of CD4+ T cells specific for a KXXS peptide from a second IE protein, β-tectorin 71–90, but not with ovalbumin as Ag (16).